While traveling in the Detroit area in November, I had the pleasure of visiting Tutto Interiors. I was fortunate that my trip coincided with their 10th Anniversary celebration! Tutto Interiors is owned by the talented Cheryl Nestro. Her design studio is located on the second floor of a wonderful historic building in charming Northville on North Center Street. After a quick flight of stairs you are greeted by photography of her inspirational interiors and awards that she has earned. One of Cheryl’s passions is the Shades of Pink Foundation. Her 10th Anniversary event was also a fundraiser for this important foundation whose mission is to help women fighting breast cancer. Their website states “Many women who are diagnosed with breast cancer have extra financial burdens placed on them during treatment and recovery. Common issues are insurance payments, food, transportation, childcare, and other essentials of daily life. Shades of Pink Foundation offers temporary financial assistance during their time in need.” The local Birmingham, Michigan chapter’s FACEBOOK page posted the event on their page on November 20th. 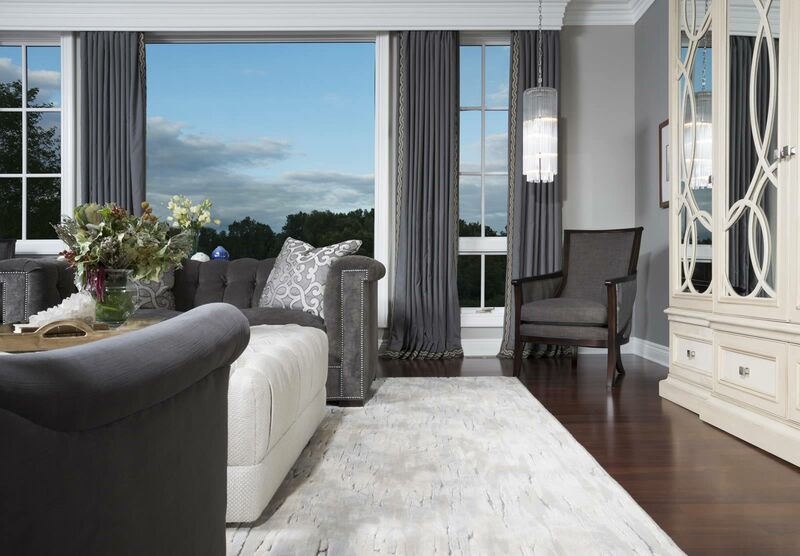 Recently we received some professional photography by Carlson Productions of Cheryl’s inspirational interiors that we are honored to share with you! We were fortunate to meet the client at this Anniversary celebration. Shown in this beautiful living room are a pair of Hickory Chair 123-89 Kent Sofas and a custom sized 179-51 Hutton M2M Console Table with hand-painted Greek key motif from our Artist’s Studio from our 1911 Collection and a pair of 5422-22 Breck Chairs from our Alexa Hampton Collection. Each of these pieces were made in our Hickory, North Carolina workroom. We are proud that over 90% of our products are made in this American workroom. Thank you, Cheryl, for sharing these beautiful images and for entrusting us to make special pieces for your clients!